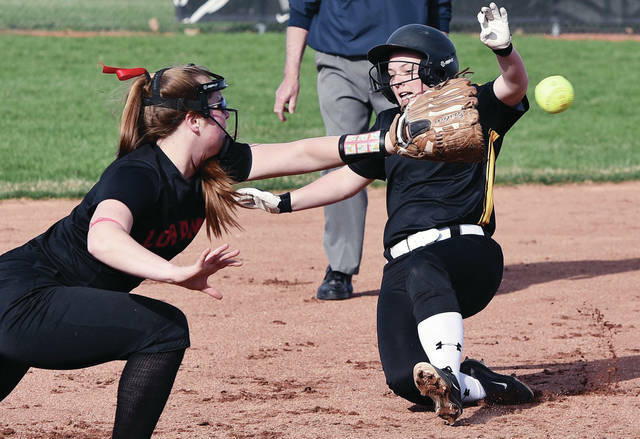 Fort Loramie’s Aleah Frilling slides safely into home as New Bremen’s Marissa Topp tries to tag her during a nonconference game on Friday in Fort Loramie. Fort Loramie's Aleah Frilling pitches during a nonconference game against New Bremen on Friday in Fort Loramie. Fort Loramie's Macy Imwalle stops a ground ball as New Bremen's Molly Smith runs for third during a nonconference game on Friday in Fort Loramie. New Bremen's Molly Smith pitches during a nonconference game on Friday in Fort Loramie. 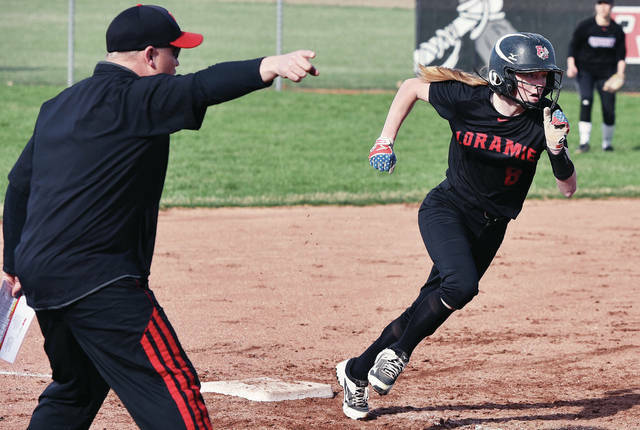 Fort Loramie's Aubrey Baker gets the signal at third to head home from head coach Brad Turner during a nonconference game on Friday in Fort Loramie. New Bremen's Hannah Kramer stretches to catch a throw as Fort Loramie's Aleah Frilling dives back to first on a pick-off attempt during a nonconference game on Friday in Fort Loramie. Fort Loramie’s Ellie Holthaus catches the throw to first to force out New Bremen’s Erin Smith during a nonconference game on Friday in Fort Loramie. 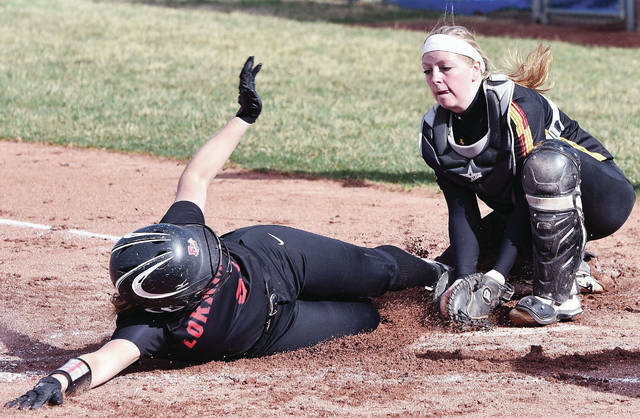 Fort Loramie’s Macy Imwalle waits for the throw as New Bremen’s Kelly Naylor starts her slide into third during a nonconference game on Friday in Fort Loramie. Naylor was safe on the play. View more photos from New Bremen at Fort Loramie here. 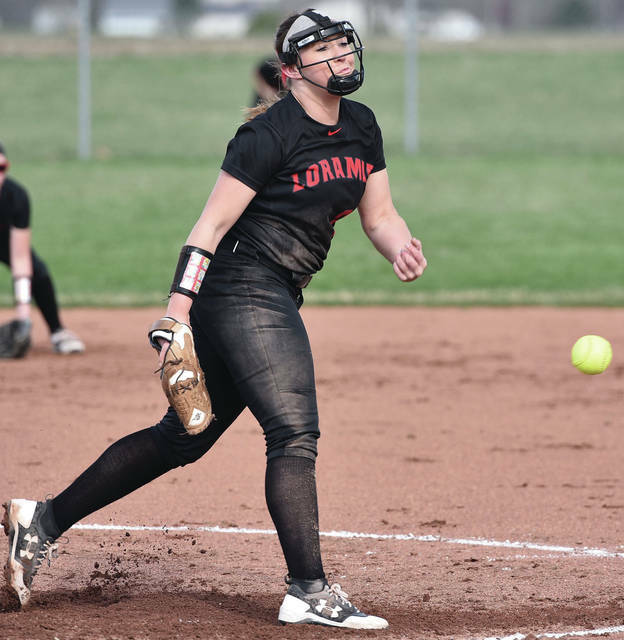 FORT LORAMIE — Fort Loramie’s softball team has come out on the losing side of several slugfests early in an up-and-down season. Calling a nonconference loss to New Bremen on Friday a “slugfest” may be underselling how tense the game was — and how many hits were slugged. New Bremen took advantage of a strong wind blowing into the field and hit home six home runs in a 19-13 victory. The teams had a combined 31 hits — and committed 12 combined errors. “It was goofy with the wind tonight,” Fort Loramie coach Brad Turner said. Kira Bertke hit two home runs for New Bremen while Abbi Thieman, Marissa Topp, Hannah Tenkman and Taylor Paul each had one. Topp had two doubles while Thieman and Molly Smith each had two. “I don’t know if the wind helped us or what,” New Bremen coach Elly Puthoff. “The girls had their sticks on point tonight, and it was great to see. Fort Loramie had many big hits, too. Ellie Holthaus hit a two-run home run to right-center field in the sixth to bring the Redskins within 15-13. Katelyn DeLoye, Desiree’ Fogt, Aleah Frilling, Clara Gephart and Macy Imwalle each had one double. The Redskins have been able to hit with just about everyone they’ve played. The issue for the young squad has been with fielding. They’ve committed five or more errors in four games, including 11 in a 17-8 loss to Fort Loramie on April 5. It’s the eighth win in the last nine games for New Bremen, which started the season with consecutive losses to Benjamin Logan and Bradford. The Cardinals (9-3, 1-1 Midwest Athletic Conference) lost a slugfest at Versailles 15-14 on Tuesday in MAC action. Puthoff, a New Bremen graduate, is in her first season as the program’s head coach. She took over for Craig Griesdorn, who retired after last season following two decades at the helm. The loss broke a two-game winning streak for Fort Loramie (6-6, 3-2 Shelby County Athletic League). The Redskins beat St. Henry in nonconference play on Monday and beat Anna 8-3 in an SCAL game on Thursday. Fort Loramie scored two runs on three hits in the bottom of the first to take a 2-0 lead but New Bremen answered with three runs on three hits in the top of the second to take control. Tenkman hit a two-run home run to left field in the inning that landed about 10 yards beyond the left-field fence. New Bremen added another run in the third but Fort Loramie scored five in the bottom half of the inning on five hits to take a 7-4 lead. The Cardinals answered in the top of the fourth with seven runs on five hits. Paul led off the inning with a solo home run to dead center field, while Bertke later hit a two-run home run to left field and Topp hit a two-run home run to center field. The Redskins tied it 11-11 in the bottom of the fourth with four runs on two hits and four New Bremen errors. Fogt hit a one-run double to get Fort Loramie’s scoring started. The Cardinals broke the tie with for runs on three hits in the top of the fifth. Thieman hit a solo home run to center field in the inning while Topp hit a two-run double. Holthaus’ home run pulled the Redskins within two runs in the sixth, but the Cardinals scored four runs on four hits in the top of the seventh for insurance. Bertke hit a solo home run to center field in the inning. The Redskins loaded the bases with three consecutive two-out hits, but a baserunning interference call ended it. New Bremen finished with 16 hits and seven errors; Fort Loramie had 15 hits and five errors. Molly Smith earned the win in the circle for the Cardinals. She allowed four earned runs on 10 hits in four innings with five strikeouts. Frilling was charged with the loss. She allowed 10 earned runs on 15 hits in six innings with four strikeouts and four walks. The Cardinals will play a doubleheader at Lima Central Catholic on Saturday and host Celina in a nonconference game on Monday. They then have a pair of key MAC matchups on Tuesday and Thursday. They’ll travel to Parkway (8-0, 3-0) on Tuesday and host Minster (10-0, 2-0) on Thursday. Fort Loramie will host Minster in a doubleheader on Saturday. Fort Loramie’s Aleah Frilling pitches during a nonconference game against New Bremen on Friday in Fort Loramie. 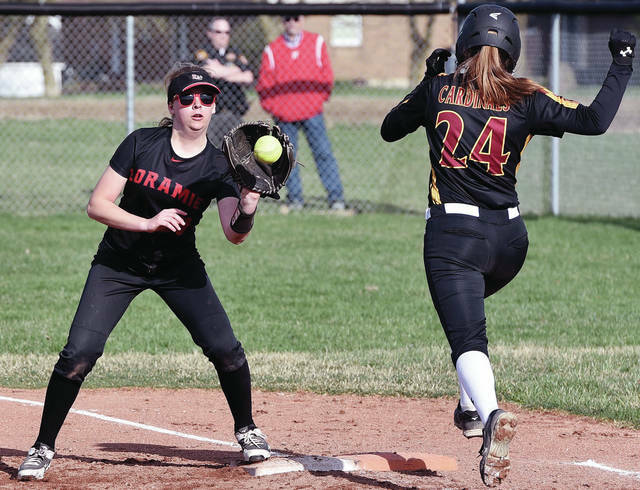 Fort Loramie’s Macy Imwalle stops a ground ball as New Bremen’s Molly Smith runs for third during a nonconference game on Friday in Fort Loramie. 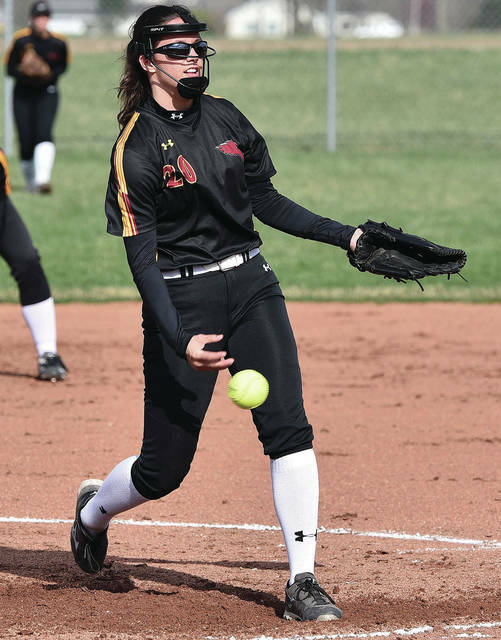 New Bremen’s Molly Smith pitches during a nonconference game on Friday in Fort Loramie. 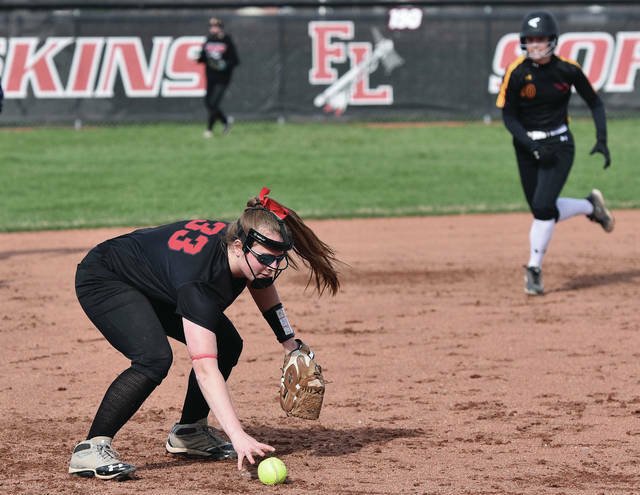 Fort Loramie’s Aubrey Baker gets the signal at third to head home from head coach Brad Turner during a nonconference game on Friday in Fort Loramie. New Bremen’s Hannah Kramer stretches to catch a throw as Fort Loramie’s Aleah Frilling dives back to first on a pick-off attempt during a nonconference game on Friday in Fort Loramie. 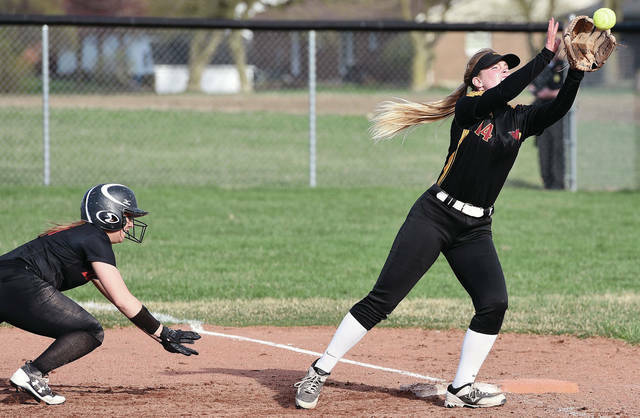 This entry was tagged Aleah Frilling, Brad Turner, Cardinals, Elly Puthoff, Fort Loramie, Hannah Tenkman, high school, MAC, Macy Imwalle, Midwest Athletic Conference, Molly Smith, New Bremen, Redskins, SCAL, Shelby County Athletic League, Softball. Bookmark the permalink.